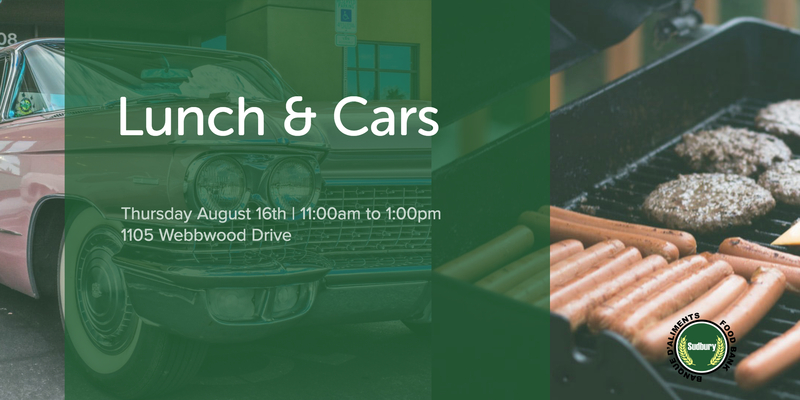 This Thursday, August 16th join us from 11:00am ~ 1:00pm for an extra fun lunch. Our Hot Dog Cart is open every weekday, but this Thursday we’ll be having some special visitors stopping buy. 92.7 Rock’s Mel and Chris will be meeting some contest winners for lunch and a selection of Classic Cruisers will be on hand as well, and you’re welcome to come on by too! So consider joining us at 1105 Webbwood Drive. The cart serves Hotdogs, Sausages, and Burgers ($5 each, $7 for a combo with a bag of chips and a drink). Hope to see you here!